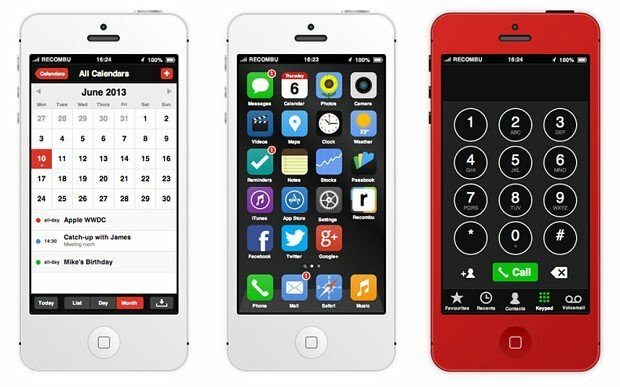 Is this a vision of the new iOS 7? Based on the designs of their British designer, Sir Jony Ive, Apple are tonight expected to launch a radically redesigned iOS 7 operating system, in what could be a make or break launch for the Cupertino giants. Expected to move Apple away from their classic mixture of icons and textures, Ive’s designs are going to deliver a simpler, flatter design approach which will modernise a design interface which has remained true to its 2007 launch roots. The new iOS 7 is being prepared for the new iPhone 5S, which will launch this September. Apple is famed for their design, and the late Steve Jobs used to obsess over it. His philosophy was based on making the book look pretty so the goods got judged positively, often more positively then they warranted. His obsession with thinner, lighter and faster devices saw many iterations of new iPods, iPhones and iPads come to market with subtle design tweaks aimed at shaving millimetres and grams off their dimensions and weight. So when Tim Cook steps on stage to deliver his anticipated keynote this evening, expect the design tweaks to be given plenty of attention by the companies CEO. Cook is a well-known advocate of his designers work, having famously described him as having “the best taste of anyone in the world”. The original iPhone, launched to much acclaim in 2007, relied heavily on easy to interpret icons and common textures. The general public were unfamiliar with navigating entirely touch based phones six years ago, and Apple had to design accordingly. As that problem has been rectified, Apple now has new problems to fight, and that comes in the challenge of keeping up with more innovative user interface designs that are coming out of Google Android. For Apple, the user training is now complete, and we can expect a much more radical interface. An additional consideration is the new range of different sized iOS devices. The iPad mini may be set to be joined by an iPhone mini, and all of this puts different design strains on the developers. Sir Jony is leading the design of an iOS for the first time, having previously been tasked with designing Apple’s ever thinner hardware. Ive takes over from Scott Forstall, who was ousted after the disastrous launch of Apple Maps with iOS 6 last year. The two share radically different design perspectives, hence the expected major changes this evening. For Forstall, it was all about mimicking real life textures, such as the leather effect found in the notes application. Sir Jony on the other hand is minimalist, and is known to dislike the use of fake effects in digital applications. Make no mistake, tonight’s WWDC address is of significant importance to Tim Cook and Apple. In the wake of Samsung’s emergence as market leader, and Apples share prices significant fall, this is their chance to show investors that they have the answers. Getting this right is key also in ensuring that key Apple loyalists don’t lose faith in the core values of Apple design, an element whose importance shouldn’t be overlooked. A seismic shift could push more swing users towards Android, so there are a lot of factors at play here for Apple. Another consideration with the new iOS is the business applications that may come with it. Miscrosoft fired a warning shot recently with news that they will bundle Outlook with their new tablets, so will Apple look to respond here too in order to keep the valuable business customers?